There's no end to fantasies about living on the moon. Actually possible moon bases, fictional Nazi moon bases, insane Newt Gingrich moon bases. 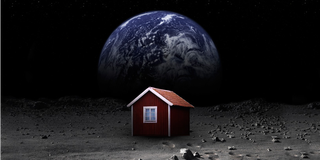 Swedish artist Mikael Genberg has a more modest goal: one, tiny, uninhabited lunar house by 2015. Of course it takes a whole lot to make that possible. First there's the matter of the house. So far it's been 75 percent designed, and the idea is that the house's carbon frame would be covered in a thin space-cloth, and somehow build itself through inflation as the whole thing is pumped full of gas. Then there's the matter of delivery. Genberg and his space-house cohorts plan to work with the Pittsburgh-based Astrobotic Technology, which is planning to make a strike at winning Google's Lunar X-Prize by being the first private company to put a rover on the moon. Astrobotic is already planning to bring along a sports drink, so a small house doesn't seem much more ridiculous, if a fair little bit heavier. But it's far from a done deal. Genberg tried this before in 2009, though the plan never got off the ground thanks in part to the financial crisis and in part to the general lack of available trips to the moon. This time though, the team has crowdfunding on its side and is asking for 15 million dollars (!) to make the ludicrous dream come true. The Moonhouse seeks to inspire people to push through our mental boundaries and change the perception of what is possible. Everyone in the world has their own personal Moonhouse – a representation of challenges and goals and how we achieve them.